We bought this house because I "had" to have a place to garden. I was born under an earth sign which means I am highly inclinded to covet all things "earth". Every winter-into-spring (right about now) I begin to feel very hopeful about gardening. I feel the urge to have my hands in the dirt, to pull out the tools from the garage and begin digging. I walk back and forth, up and down our hills--surveying what I might want to do this year, taking stock of places I felt I just couldn't possibly stand another year--and promise I'll get to FIRST this year. I take more trips to the home store and to my favorite gardening center to watch the trays of annuals arrive. Jokingly the guys ask, Starting already, Kelly? I smile and say, No just looking. (Fifteen minutes later, I have my wallet out). I am not getting younger. Gardening keeps you in check on that front. What I once accomplished in a day, may now take me two or even three days. Is that age? Or is it wisdom? I think the latter. I dread the first mowing. Dread. It. Of all gardening and lawn chores in the world, the one I wish I could rid myself of is mowing. I've come up with a plan for this: cover as much grass as I can with food and/or perennials. Truly, if I felt I could, I'd cover every square inch of my yard. It makes me cringe to drive past a "full sun" yard on FLAT land and see not one single seed sown. What a waste. Converting this grassy flatland to food was a no-brainer. But I didn't want to till--no tilling is always preferred. So I built four more lasagna gardens. The nifty little square foot cedar boards compliments of an awesome sale I caught at Home Depot. They'd marked down last year's SF garden kit to half off to make way for this year's newer version. I may bring home one more kit. I've laid out my fence posts around this to accomodate one more four foot bed, just in case. I am very excited about this new no-mow area I've created. Dr. Thyme is going to fence this for me. It sits squarly two levels down from our house and outside my kitchen door. For all intents and purposes, it will be one less area the mower must travel across, and one more area for me to harvest. More work? Yes. But big payoffs in the end. *Remember the canning-palooza I had last fall with all my green tomatoes? Use a jar of it at least once a week. Love it! My body needed two days to recover after lugging all the newspaper, bales of peat, water and eight--yes, eight bags of 40 lb. organic peat mix down the two hills. And by no means are these beds ready for planting. I needed to do preliminary prep over the soil now. I should have done this in November, but with my seasonal affective disorder in full swing then--I had absolutely zero desire to think about such things. I laid four layers of newspaper down, then a two inch layer of peat followed by about two bags of organic peat per each square. My hope is that the ground under the beds (the clay and rock) might invite more worms to the party and begin to loosen up. I'll need to add more amendments to the bed, but this gives me a leg up on the soil prep for the time being. In anticipation of all this earth/garden time I have ahead of me, I try to stay in the best physical shape I can through winter--while consuming as much cake as possible! This year has proven slightly easier because a) we have a treadmill, and b) it's only snowed twice. I went for nice four-mile jog last week. On my way out I saw a sign that read, "free wood chip mulch". It stopped me in my tracks and my route was diverted. I needed to see this so-called "free" mulch. Sure enough. At the end of a driveway was a pile of fine wood chipped mulch. Our street crews had been through here and trimmed the side of our very curvy road sides and in the process, removed quite few cedar trees and branches of other trees along with them. I knew this mulch had to have come from their work. It smelled exactly like cedar. Cedar mulch is one of the best mulches out there IMHO (and is pricey). I find it not only lends a lovely aroma around the beds--it repels quite a few insects in the process. So I spoke with the owner of the driveway and he said, Take it all if you can! Well, my back would only allow me to take a few bags at a time. Getting this mulch was a great start to my gardening chores. Sure I needed a two hour soak in the tub after, and a two day break from the garden, but totally worth it. Meantime, the rest of the beds wait. If you ask me, this is one of the best looking collard plants I have ever seen. I am going to keep my collard, brussel sprout, cabbage, cauliflower and broccoli bed as is. They did not go dormant and thus, will remain. They could easily last two--maybe three years. They are heavy feeders, but so far are proving literally maintenance free. (That could be owing to the fact that I am not a HUGE fan of any of these veggies and have barely touched them.) BUT: it's one less place to mow and sits outside my fenced-in area. The deer seem to share my disdain of the cruciferous. (Okay, I take that back. I like cabbage.) I honestly was blown away by the health of this plant. Strawberries. This was the ever-bearing variety. And again, I did nothing to this plant but eat from it now and then. Looks good so far. Started my seeds yesterday. Whoa. What a big pain in the neck. I really complain a lot when it comes to this chore. (Just ask DH.) I have no idea why this seems such a thankless task. Maybe it's the impatient side of me. It is tedious. It is messy. But I'd rather pay a buck forty for a packet of tomato seeds now, then face the onslaught of temptation in Apri where the very same single seed plants go for three or four dollars! So my common sense overrides my griping on this front. But for the record: I really hate this part. Now if you are interested in a really good veggie burger, give this one a try. The reason I was smitten with this recipe when I saw it in the Food section of the Post-Dispatch last Wednesday, was because FINALLY there was a page of, "Hey, I might like to try a couple of these recipes!". I typically bemoan the absence of inspiring veggie quality options. But like a kid with a new gift to unwrap, I anticipate every food Wednesday with the hope I might be inspired. 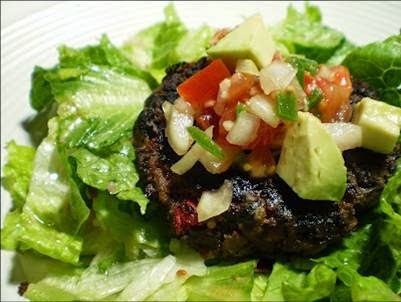 Miracle of miracle--they published this North Peak Veggie Burger recipe. Mmmm. I adapted the recipe slightly. I omitted the honey, amped up the dried spices (some oregano, thyme and cayenne pepper were added), then added diced jalapeno pepper, minced garlic and a tablespoon of nutritional yeast then sprinkled Italian bread crumbs and Panko bread crumbs over the mixture--adding just enough to make the mixture stick together. I skipped baking them. Instead they went right onto the cast iron skillet and cooked over medium heat for about 20 minutes until they were nice and browned on each side. I thought they worked nicely over a bed of lettuce. The pico de gallo is a must, as is the avacado. This was a wonderful dinner. I served it with a side of oven fries! Yum! I know exactly what you mean by eagerly looking at the PD recipes to find something meatless! The burger looks amazing. Here's wishing you a happy and bountiful garden season this year. One reason I love reading your blog is that you're ahead of us weather-wise and so I can live vicariously through your photos! I have a daffodil that's beginning to bud, but no blooms. This morning I woke to snow. I've started my few tomato and pepper seeds, too. What is it about Spring that always makes me optimistic--feeling that I'll do all the things I'm supposed to do in a garden instead of running out of steam in July? Here's hoping! Hi Nupur! I am so glad to hear there is at least one other person in STL who longs for veggie recipes on Wednesday! Hi Bonnie! I love hearing from my fellow master gardeners from other geographies! It is going to be in the upper 70s TOMORROW! How crazy is that? I hope you have good luck with the veg seeds. And me too, on the optimistic front.